Eco-Foil is a revolutionary new foilware product designed to give consumers like you a convenient and affordable way to reduce your carbon footprint, live greener lifestyles, and do your part for the environment! Not only is it made from 100% recycled aluminum, but it is also 100% recyclable after use — making it part of a phenomenon called “closed-loop recycling.” When you purchase and use recycled Eco-Foil products, and then put them in your recycling bin to get recycled again, you complete the cycle — the aluminum is then re-made into another new recycled pan … and the cycle just goes on and on and on! Eco-Foil offers a variety of products to choose from, including roasters, baking pans, and a broad line of favorites ranging from King Roaster® with handles (a Handi-Foil exclusive) to the Cook-N-Carry® line of pans with lids. All made from 100% recycled materials — even the plastic lids.Eco-Foil is the perfect eco-friendly choice for all your baking, roasting or grilling needs —and a great way for you to save natural resources and protect our earth, one pan at a time. You can find Eco-Foil at major grocery chains and mass market retailers nationwide where Handi-Foil is sold. 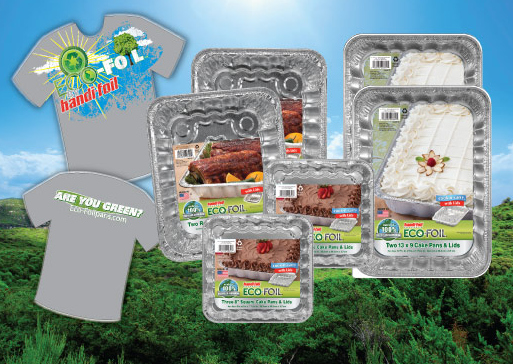 If your local retailer isn’t carrying Eco-Foil yet, tell them you care — and ask them for Eco-Foil products today! Giveaway ends November 20, 2012 at 11:59pm Central time. US 18+ only. I love cooking a roast in the oven, makes the whole house smell delcious. Thanks! My favorite thing to cook is cheesy potatoes! I love to bake a chicken with carrots, potatoes and onions in the same pan. Liked Eco-Foil on Facebook: Nicole Sender. Following Alicia on Pinterest: Nicole Sender. Following Handi-Foil on Pinterest: Nicole Sender. My favorite food to cook in the oven is a Italian sausage/cream cheese/spinach lasagna. I love to bake all year, but especially at Thanksgiving and Christmas. For me, it’s all about cakes, cookies, brownies, and muffins. Thanks for the great giveaway! I can’t wait for Christmas!!!! I like to cook Lasagna. My favorite food to cook in the oven is Lasagna. I “Like” Eco-Foil on Facebook. I Follow Alicia on Pinterest. I Follow Handi-Foil on Pinterest. I love to make Lasagna in the oven! My favorite food to cook in the oven is chicken pot pie! I liked eco-foil on FB. I love to meat loaf but hate the mess! I follow you on Pinterest as Anne Loyd. I follow Handi Foil on Pinterest as Anne Loyd. Baked Ziti is my favorite food to cook in the oven. I love to cook roast beef, potatoes, and carrots in the oven. You have such great giveaways, that I ended up entering five of them. Gee, I hope that I get lucky and get my name selected on at least one contest. You also make it easy to enter the giveaways. My favorite food to cook in the oven is baked chicken. I like to bake chicken in the oven. My favorite food from the oven is baked chicken with salsa, sour cream, and cheddar! I Like Making Time For Mommy on Facebook!! I like to cook lasagne in the oven. I follow HandiFoil on Pinterest as jmessali. I love making brown sugar glazed ham in the oven. I like Eco Foil on FB. I cook salmon in the oven. Our favorite food to cook in the oven is lazagna. i commented on another psot! i “liked” this blog on facebook! I love to roast a turkey in the oven! Lasagna is my favorite food to cook in the oven. I “liked” you on FAcebook as Amber Gillespie. I like EcoFoil on Facebook. Chicken. I can’t always grill, but an oven can do a great job. I follow Alicia on Pinterest. Christian Alejandro N.
My favorite food to cook in the oven is brownies. Yum! I love to roast chicken and potatoes in the oven! I love to bake macaroni & cheese.